1	Season the flour and sprinkle over the chicken. Dip the chicken in the egg and then in the panko crumbs to evenly coat. 2	Heat the oil in a frying pan and fry the chicken on a low heat for 10 minutes, turning occasionally until cooked throughout with no pink meat and juices run clear. Remove and keep warm. 3	Meanwhile, cook the udon noodles in a pan of boiling water for 6 minutes then add the edamame beans for 3 minutes, then drain well. 4	Wipe the frying pan out with kitchen paper and heat 1 tbsp oil. 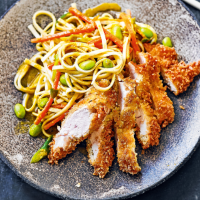 Fry the carrots and salad onions for 3 minutes, stir in the katsu curry sauce and 100ml water and cook for 1 minute, stir in the noodles and beans and warm through. Serve the noodles topped with the chicken cut into 2cm wide strips.